My idea started with the pencil line - I decided to use golden mica. Regarding the theme and colours, I was thinking about expressing the contrast between light and dark, or yin and jang. For the scent I made a EOs/FOs blend using Almond Milk, Orange, Eucalyptus, Tea tree and Sandalwood. The night before I had even dreamed about which recipe to use. Finally I decided for the "high percentage of hard oils" recipe as I wanted a white base and didn´t plan to use TD. I like hard oils and butters, use them a lot, usually with milk/buttermilk and no problems so far with trace. But with so many colours and swirling to do I was very careful. I prepared everything, I had a paper with written steps to be able to concentrate fully. For colouring one half I used Activated Charcoal (dark grey), Cocoa powder+AC (brown), Ultramarine+Red Ocre/Red Oxide (burgundy), for the other half White Mica (white), Yellow Oxide (yellow) and Yellow Oxide+White Clay+Red Oxide (Apricot). I didn´t plan to add any other additives, this was enough for me! I took a deep breath and started. My oils and lye were around body temperature, after emulsification I feeled the heat and got the impression of thickening so I divided the soap to the prepared cups with colours and started stirring. I was lucky that my husband was helping me to take care of all the eight bowls and cups! And we stirred and stirred and the soap was still thin, and as we have a quite cold flat, it lost the heat. I couldn´t use stickblender in the small cups, so more stirring and stirring, I even put everything in the oven for a while and stirred again, this all for at least an hour and a half. When it finally appeared to be a little thicker I lost my patience, swirled and poured. It looked like all the colours mixed completely together and the batter was still super-thin in the mold. So straight in the oven and I had to start tidying up and doing the laundry, just tried to do other things than check the soap every ten minutes. Is it false trace? Bad lye? It behaved really strange. After some three hours it was still almost pourable but smooth. I relaxed when I caught the soap gelling - after some five hours in the mold! Today in the morning unmolded, after two hours cut - I was so happy to see the solid soap! My pencil line is barely visible but the colours turned out much better than I expected. I like the look, it goes well with the delicate scent. This techique was really hard for me, but a lot of fun! 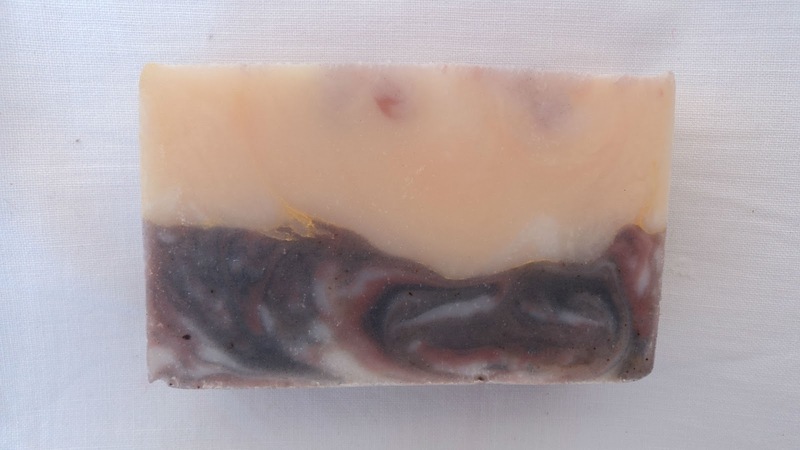 I will definitely try it again because I like the complex yet subtle look it gives to soaps. 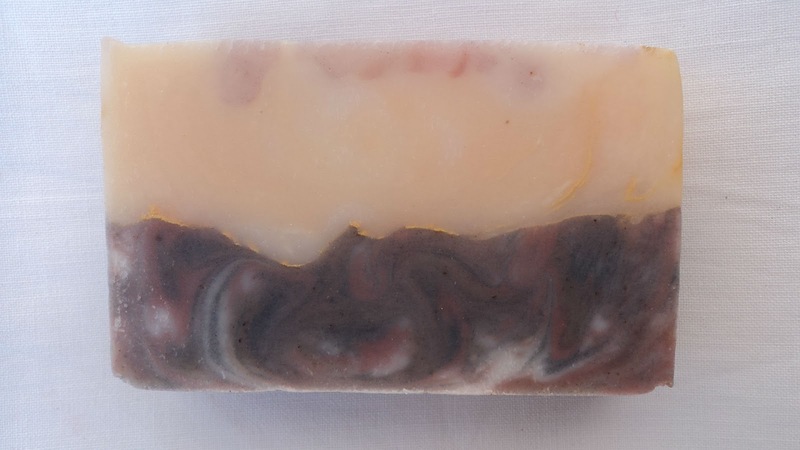 All of the Challenge soaps I´ve seen so far are wonderful and very original! I like your wavy pencil line and agree with you this one was a challenge! Nice warm colors and beautiful swirl. It looks very comforting. Thank you all! Amy, it´s nice to know that even experienced soapers encounter similar promblems...soap is sometimes unpredictable!